From the director of 'Rain Man and 'Good Morning Vietnam'. Sam Kirchinsky came from America from Poland in 1914. Arriving in Baltimore on the Fourth of July, it was the most beautiful place he had ever seen. Sam and his brothers married in Maryland. Soon they were joined by aunts, uncles, cousins. The family came together. And grew apart. 'Avalon' chronicles the compelling story of the Krichinsky's - from early traditions of Turkey, thanksgiving and Independence Day endorsed by Sam (ARMIN MUELLER-STAHL) and Eva (JOAN PLOWRIGHT) to the limitless ambitious of the new generation - a generation of TV sets and discount department stores embodied by Jules (AIDAN QUINN) and Ann (ELIZABETH PERKINS). From the director of 'Rain Man', 'Avalon' is the humourous and touching story of the never-ending, ever-changing pursuit of the American Dream. 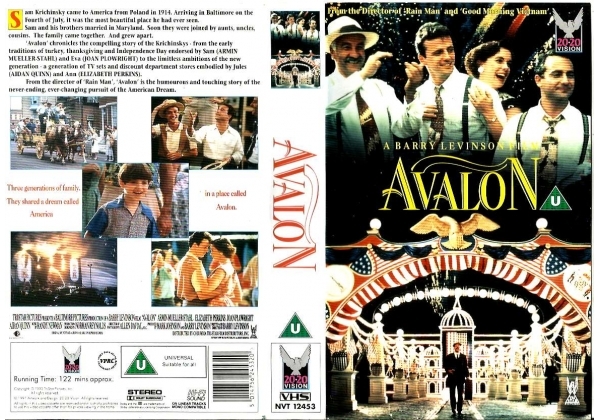 Or find "Avalon" on VHS and DVD / BluRay at Amazon.